THPBlog: Sierra Pacific Industries to log in spotted owl habitat near the South Fork of the Trinity River. Sierra Pacific Industries to log in spotted owl habitat near the South Fork of the Trinity River. This THP is about 22 miles east of Eureka and about 15 miles SW of Willow Creek at an elevation of 3,440 to 4,560 feet. The THP area drains into the South Fork of the Trinity River which is listed as impaired for sediment/siltation and temperature. 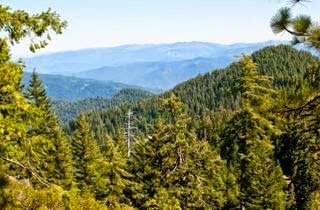 Sierra Pacific Industries is planning a clearcut and shelterwood removal tractor and cable logging operation in Douglas fir and white fir forests. There are multiple wet areas, and an unstable area in the cable logging portion of unit 22. Nodding semaphoregrass was found in unit 21A, Humboldt mule ears was found in unit 22C, and heartleaf twayblade was found in various locations throughout the THP area. The THP contains trees over 130 years old, and will involve logging within spotted owl habitat. For spotted owl site HUM0095; this THP will remove 6 acres of foraging habitat within .7 mi, and 26 acres of nesting/roosting habitat within .7 mi; for spotted owl site HUM0192; this THP will remove 13 acres of foraging habitat within 1.3 mi, and 15 acres of nesting/roosting habitat within 1.3 mi. More information is available on the THP Tracking Center website.